There is a real elegance and sophisticated feel about this rustic, vintage design. 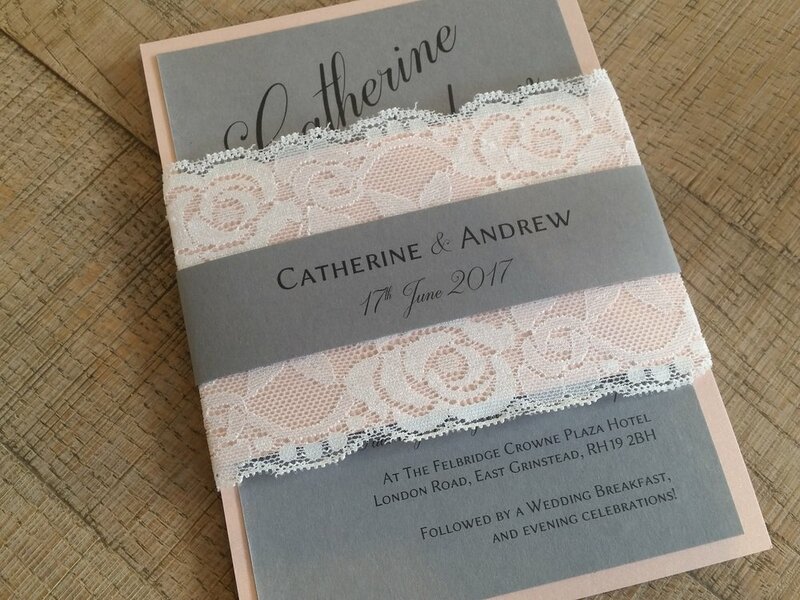 The very wide, floral decorated lace, grey and pink cardstock with the band around the middle, is a magical combination. The colour of the cardstock can be changed to match your colour theme. All the stationery is printed and mounted on luxurious 300gsm card, with a selection of finishes, which adds to the luxury 'look and feel'. Stationery is printed on 7 x 5 inches when flat and comes with an envelope. Invitations can be made in many different options: please ask! Invitations can be printed on different styles of card - hammered white or ivory, matt white or ivory, linen white or ivory, pearlescent white or ivory (this gives it a slight sparkle). So many lace designs to choose from.